Nordstrom’s Oatmeal Cherry Cookies are supposed to be like the cookies sold at the department store’s coffee shops. I couldn’t tell you if they are the same as the store’s, but this recipe is a good one. Here’s an updated photo. And here’s the old photo from many years ago. Let’s pretend this photo never happened, shall we? 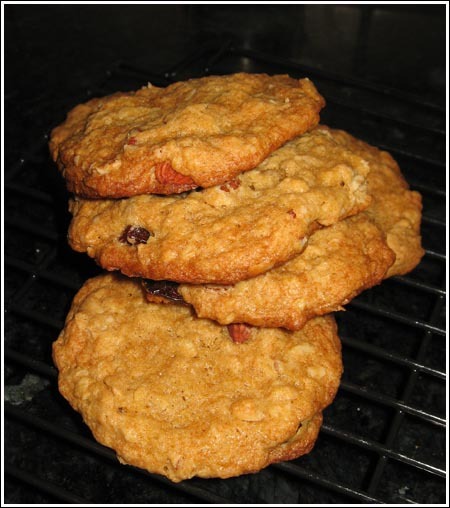 Bad photography aside, the recipe is worth making if you like semi-flat, chewy, oatmeal cookies. This recipe is supposed to be similar to Nordstrom's Oatmeal Cherry Cookies . Whether or not that is true, these are good cookies. Using an electric mixer, beat butter, brown sugar and salt together until mixture is creamy. Add eggs one at a time, beating 30 seconds after each egg. Stir in milk. Stir together flour, baking powder, and soda, then blend dry flour mixture into creamed mixture. When flour mixture is incorporated, stir in oats, cherries and nuts (if using). Cover and refrigerate for a few hours. Preheat oven to 350°. Line a couple of baking sheets with parchment paper. Drop chilled dough by tablespoonfuls about 3 inches apart onto parchment-lined baking sheet. Bake 12 minutes, or just until cookies puff and are lightly golden brown. Do not overbake. (Cookies will flatten as they cool.) Slide parchment from baking sheet onto wire rack to allow cookies to cool completely. I haven't figured out the yield on this one -- probably about 2 1/2 dozen. I've been baking up a few cookies at a time. I loved the coconut cookie at the ebar. Very special. I don’t even know where I got this recipe but the cookies were great! As you see, I linked to the Nordstrom book so people will be able to get what Nordstrom wants you to believe is the real recipe. Although these cookies look good, this is not Nordstrom’s “Dried Cherry-Oatmeal Cookies” recipe. 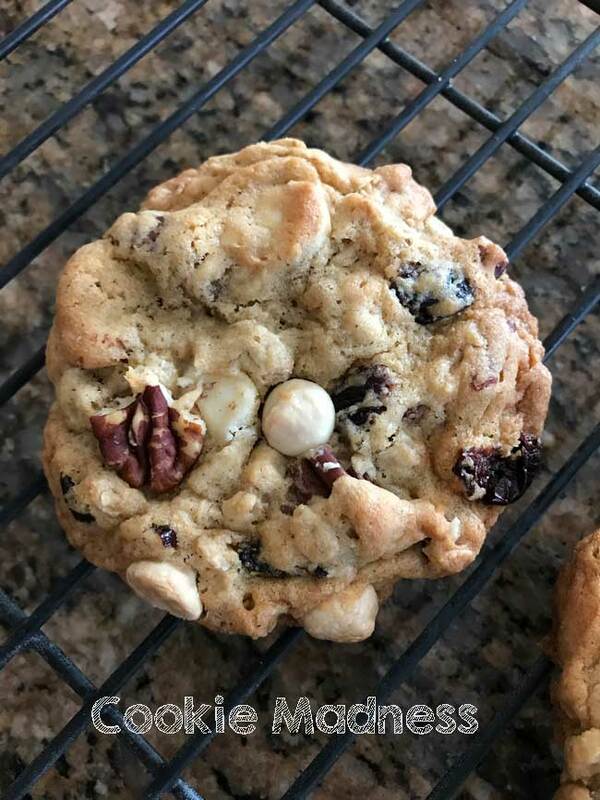 You can find the actual Nordstrom’s recipe in their “Entertaining At Home Cookbook”…..and the cookies are beyond fantastic! Would also like to have the brown sugar cookir, maybe called maple cookie. I couldn’t find the recipe on-line, but Nordstrom has a couple of cookbooks with recipes from their cafe. I’m not sure if either of the books include recipes for cakes and cookies, but they both sound like good books nonetheless. You can order them off Amazon. Here are some links. If I come across the crumb cake recipe, I’ll let you know.